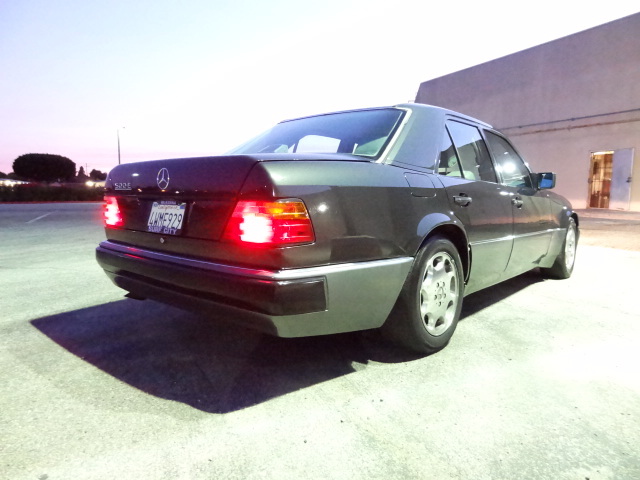 1992 Mercedes-Benz 500E: Ridden Hard and Put Away Wet, But Dirt Cheap for a MercPorsche! Since I was about 12 years old I’ve had this fantasy of taking some dilapidated old car and making it showroom new once again. I had this vision of rolling the project into my garage semi-wrapped in a tarp, spending my nights and weekends out there rebuilding, refurbishing, and replacing, maybe even some paint and bodywork, and eventually pulling it back out of the garage to the accolades of my friends and family who knew the blood, sweat, and tears I’d invested. Sort of like John Cusack’s Lane Meyer character in Better Off Dead did with the 1st generation Camaro that his dad (M*A*S*H’s Charles Emerson Winchester, III) had threatened to have junked. My problem is that I am lazy. And poor. 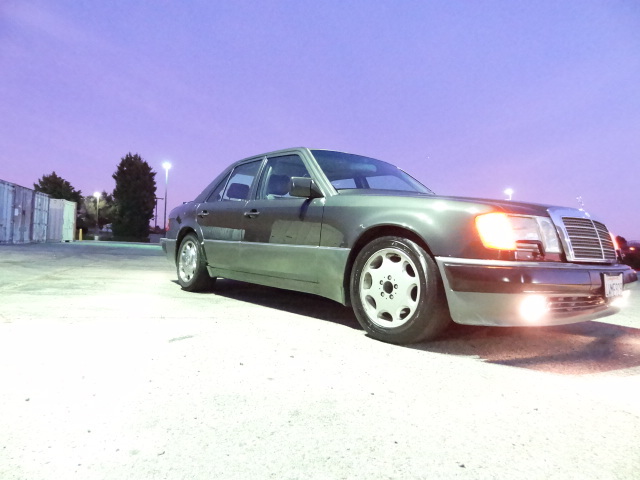 Still, this rare, Porsche-built Mercedes-Benz 500E needs just enough that its price is the lowest we have ever seen for one, and its needs are largely cosmetic in nature. Surely I could make it perfect. Or you could. Find it here on eBay in Huntington Beach, California with a Buy It Now price of just $6,550 or best offer. We have talked before about how values of these cars are on the rise, and rightfully so. They represent a rare piece of history for two German manufacturers: Mercedes-Benz and Porsche. I won’t bore you with all the details again, but suffice it to say that after Mercedes saw what (pre-Mercedes-owned) AMG did with the W124 chassis in building the V8-powered Hammer, they decided to do it themselves, but with the polish befitting a Mercedes as opposed to the rough and raw readiness of the AMG car. In order to make it all work, they rang-up the fellows across town at Porsche and asked for a little assistance. The result was the stiffened, widened, lowered M119 V8-powered beast you see here. And yes, it all works together brilliantly. On the outside, apart from the gross chrome wheels (well, three out of four of them), a couple of pieces of missing trim, faded paint, and stress-cracked headlight surrounds, this car actually looks remarkably straight. For those of us where salt is used judiciously on the roads during the dark months I would also point out that it appears rust-free, apart from some minor surface scraping under the trunk floor. The fact that the ultra-expensive flared front fenders and rear quarters are present and straight is worth a lot. The cracked 500E-specific front bumper cover is probably best repaired if you know your way around basic fiberglass work, or you know someone who does. You could always watch how Wheeler Dealers’ Edd China does it. He’s good. Inside the car you’ll find a fair amount of work to be done, but again nothing really out of the ordinary. The ugliest thing inside the car is what looks like a dog bite taken out of the driver’s seat bolster. There is also a hole in the leather covering the armrest. Beyond those, the headliner is sagging, the wood is a little cloudy (but remarkably not excessively cracked), and the console box lid needs some fettling. 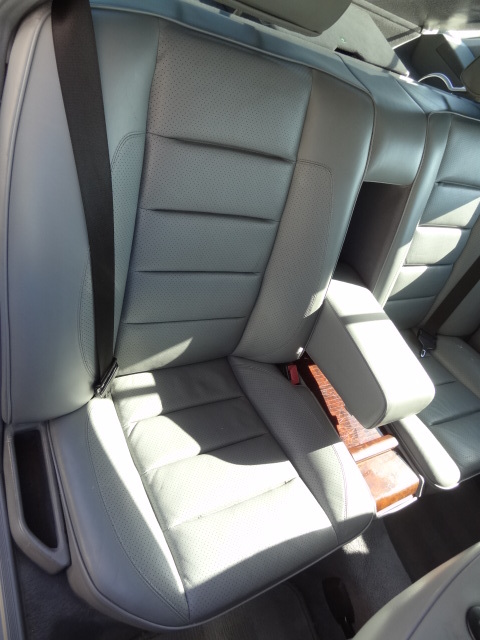 The two-place rear seats look nearly new, as does the front passenger seat. Some factory floormats would do wonders for the interior aesthetic as well. The trunk is dirty, but the paneling is all there. The factory CD-changer is missing, but that’s just as well these days, isn’t it? What that means is that the cable for that has been freed-up for use with an iPod adaptor. 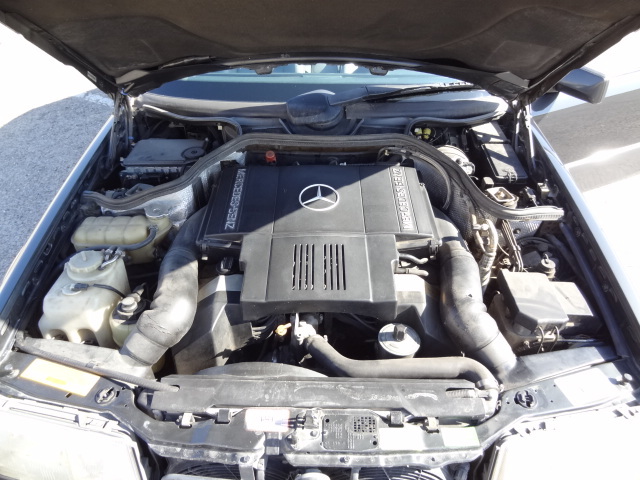 Mechanically, the seller indicates that the car drives and shifts well, but there are two fundamental problems: 1) the “Check Engine” light is on, and 2) there is an oil leak. Taking these in reverse order, he indicates that it “looks like” the oil leak may be coming from the oil pan gasket. This would be the ideal scenario, but knowing the M119 there are a number of other possibilities. Conservatively, I would budget $2,000 to deal with oil leaks and be pleasantly surprised if it comes in cheaper. Conversely, spend $1.95 on a baking sheet to slide under the car if it’s going to sit for a long time, and pour more oil in as needed. Regarding the CE light, that’s a different can of worms. The plus side is that the car is not driving in a “limp home” mode (at least it doesn’t sound as if it is from the description provided), but the down side is that the light can be triggered by any number of things, ranging from catalytic converters to throttle bodies to the dreaded Earth-friendly disintegrating wiring harness. You can pull the pre-OBDII codes to see what it says, but again I would expect the worst but hope for the best. I would say that at 200K miles it is very likely that the wiring harness has been done. In many ways, the decision on a car like this comes down to a few factors: 1) what you are able to do yourself – both cosmetically and mechanically; 2) whether you know someone who can do what you can’t, or you’ve got a close relationship with a professional who will be straight-up with you both on diagnosis and price; and 3) how lucky you are. These are insanely well-built cars and we’ve seen them with well over 300K miles (I had one with almost 270K on the clock and it still ran and drove perfectly)! Beyond what is stated, the usual inspection provisions would also apply here (does the self-leveling rear suspension work, etc. ), but this car screams opportunity for the right person. After all, it is highly unlikely there will ever be another MB-Porsche collaboration, and there are fewer and fewer of these on the road every year, because many owners just don’t appreciate what they have. At the same time, list prices for the best now exceed $40,000, with mediocre cars selling for $12,000 and up. That certainly gives the buyer of this one a fair amount of room to make this one great, doesn’t it? 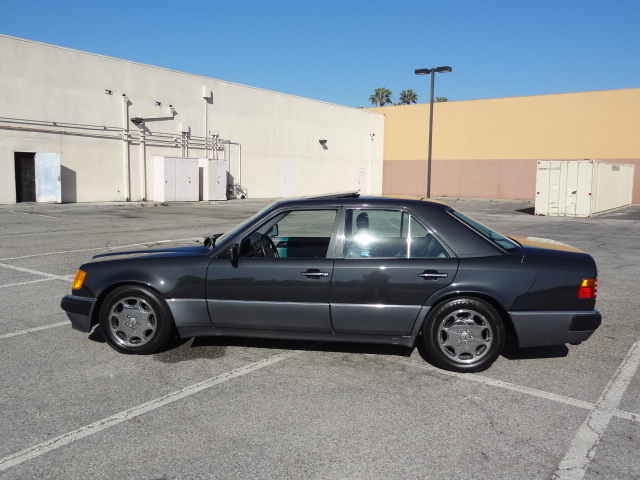 This entry was posted on Wednesday, February 20th, 2013 at 9:16 AM	and tagged with 124.036, 500E, AMG Hammer, Audi S4, Audi S6, BMW M5, Edd China, Mercedes-Benz, Porsche, Sindelfingen, Volvo 850R, W124, Wheeler Dealers and posted in Totally That Stupid. You can follow any responses to this entry through the RSS 2.0 feed. « 1986 Audi 5000CS Turbo Quattro: A Shame To Drive It?